The Oral-B Smart 6 electric toothbrush is a fantastic electric toothbrush with many features including 5 cleaning modes, bluetooth connectivity and a premium travel case. N.B. 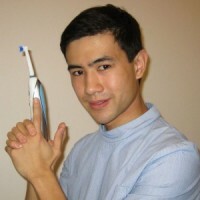 If you want to find out the electric toothbrush I consider to be the best click here. The Oral-B Smart 6 6000 electric toothbrush is high end electric toothbrush with many features. 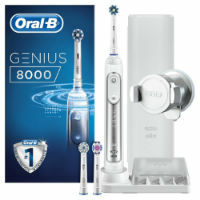 In the Oral-B range it sits between the mid-range Oral-B Smart 5 5000 and the premium Oral-B Genius 8000. Does it’s range of features justify the high end price tag? 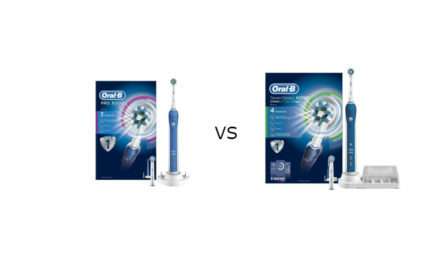 How well does the Oral-B Smart 6 6000 match up to it’s rivals. Find out more here. The Oral-B Smart 6 6000 electric toothbrush comes stacked with features. On the front of the handle are two buttons instead of one which is found on the cheaper Oral-B models. There is an on/off button which as the name suggests turns the electric toothbrush on and off. There is also a second button with a downward arrow on it. Pressing this button changes cleaning modes (More on this later). What this means is that you can turn the Oral-B Smart 6 6000 off without having to cycle through all the cleaning modes which is a massive bonus! Also on the front of the handle is the battery indicator which is well designed and also the smart ring visible pressure sensor (more on this later). The handle is waterproof so you will be able to wash those grubby toothpaste stains with running water and use it in the shower if you so wish. At the back of the handle is a white rubberised textured grip, which allows good grip even when wet. The smart ring extends around the back of the electric toothbrush handle allowing it to be easily seen. The handle is slightly larger than the cheaper models in the Oral-B range giving a chunkier feel. This means that the handle is slightly heavier weighing in at around 132 g. This is still light enough to use the electric toothbrush easily. The Oral-B Smart 6 6000 comes with an in handle 2 minute timer that single buzzes every 30 seconds to let you know when to change area of your mouth. This is handy as it informs you when the 2 minutes are up without needing a connection to your smartphone. After 2 minutes the brush head will double buzz to differentiate it from the 30 second buzzes. A visible pressure sensor is so useful on an electric toothbrush and is one of the main advantages of electric toothbrushes over manual toothbrushes. The Oral-B Smart 6 6000 has the added benefit of being able to personalise the colour based on your preference. This is done through the Oral-B App and is called a smart ring. If you have more than one Oral-B Smart 6 6000 handle this will allow you to differentiate between them. The Oral-B Smart 6 6000 comes with a smartphone holder that looks a little bit like a white plastic hockey puck. It is well designed and will fit most smartphones. 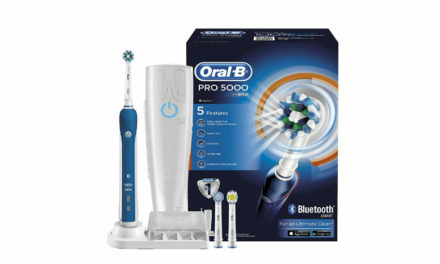 It is particularly useful when using the Bluetooth connectivity and SmartCoaching features of the Oral-B app. The Oral-B range all use the 3D oscillating and rotating movement which claims to remove up to 100% more plaque vs a manual toothbrush. Personally I think this could be exaggerating slightly however there is definitely evidence that electric toothbrushes do clean better than manual toothbrushes. The figure though is closer to 21% over a 3 month period. This is definitely an improvement so would still recommend getting an electric toothbrush with 3D oscillating rotating motion. The Oral-B Smart 6 6000 comes in 3 different versions, all of which have the same electric toothbrush handle. The main difference is between the brush heads that come as standard in the box. Smart 6 6000N is the most common version and comes with the 1 x crossaction, 1 x sensitive and 1 x 3D white brush head as standard. 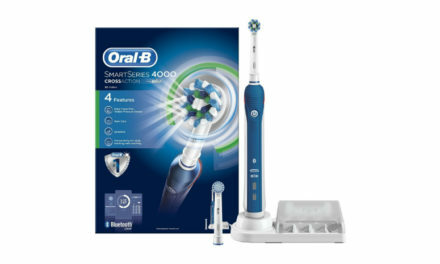 Oral-B Smart 6 6000S is the sensitive version and comes with 2 x sensitive and 1 x crossaction brush head as standard. Smart 6 6000W is the whitening version, I would not recommend buying this one. It comes with 2 x 3D White brush heads and 1 x crossaction. Out of the brush heads, I would recommend trying out the CrossAction Brush head. The crossaction brush head has 16 degree angulation of bristles which allow you to clean effectively around the gum margins. Also the brush head is small and round which allows the brush to access difficult teeth easily. It also has indicator bristles which give you an indication as to when the brush head needs changing. I would recommend changing your brush head every 3 months. The Oral-B Smart 6 6000 comes with 5 cleaning modes which is the same number as the more expensive Oral-B Genius 8000. It comes with daily clean, sensitive, gum care, pro-clean and whitening. I would recommend putting the brush in daily clean mode for most people because it is the best regular use brushing action and lasts for 2 minutes. The sensitive mode is good for people who have sensitive teeth and can be combined with using a sensitive brush head. Gum Care, Pro-clean and whitening I would only use for special occasions and should not be used regularly. The Oral-B Smart 6 6000 comes with an upgraded lithium ion battery that has recently been rolled out. It is an excellent battery that has good capacity. The Oral-B Smart 6 6000 will last for 2 weeks of use, which is 2 minutes twice a day. This means if it was left on continuously the battery would last for 56 minutes. This is a massive leap forward from the previous model which used a nickel hydride battery and only lasted for half the time. It takes roughly 12 hours for the Oral-B Smart 6 6000 to charge from flat, so leaving the battery charging overnight will get the battery close to full charge. The charging station that the Oral-B Smart 6 6000 comes with is actually not as good as the cheaper Oral-B Smart 5 5000. This is because it only holds two brush heads instead of four. The charging station still holds the electric toothbrush handle vertically and is well designed. As with all Oral-B charging stations, it comes with a 2 pin plug. This is fine if you have access to a shaving plug socket in your bathroom, if not then you will need a 2 to 3 pin adaptor like the one below. The Oral-B Smart 6 6000 now comes with a premium travel case similar to the one on the Oral-B Genius 8000. It is a fantastic travel case that is made from soft touch plastic. It provides good protection for your Smart 6 6000 on your travels and is small enough to easily fit into your hand luggage. This is very portable and lightweight. This electric toothbrush costs £65.79. This is reasonable considering the amount of features that you get with the package. The Oral-B Smart 6 6000 comes with a 2 year warranty that can be extended to 3 years by visiting the Oral-B website and registering your product. Click here to go to the relevant Oral-B Page. If we take the minimum amount of time that this electric toothbrush will last you to be 3 years (although mine has last me 5+ years), this gives an average running cost of £2 a month. If we use Oral-B CrossAction Brush heads at a rate of one every 3 months. This brings the total running cost of brush heads and electric toothbrush handle up to £3 a month. The only other costs you should factor in is the cost of water and electricity which will be minimal. I would recommend you clicking here to find out what I consider to be the best electric toothbrush. Is the Oral-B Smart 6 6000 waterproof? Yes it most certainly is. This means that it can be cleaned with water and also be used in the shower if you so wish. Is the Oral-B Smart 6 6000 noisy? No the Oral-B Smart 6 6000 is not particularly noisy for an electric toothbrush however this is subjective. If you have just moved from a manual toothbrush expect any electric toothbrush to be noisier. You will notice this less and less as you continue to use an electric toothbrush. Is it safe to use the Oral-B Smart 6 6000 on dental implants/bridges/restorations/crowns? Yes it is safe to do so. The human bite puts considerably more force on the teeth than an electric toothbrush does. If a dental implant/bridge/restoration or crown fails when using an electric toothbrush, it would have failed anyway the next time you ate. Is the Oral-B Smart 6 6000 suitable for children? The Oral-B Smart 6 6000 has not been designed specifically for children in mind and thus I cannot recommend it for children. If you do want a children’s electric toothbrush, I would recommend clicking here to find out which one would be suitable. How do you change cleaning modes on the Oral-B Smart 6 6000 electric toothbrush? You change cleaning modes by clicking the downward arrow button which is located on the front of the electric toothbrush handle. Unfortunately the Oral-B Smart 6 6000 does not have any icons for the cleaning modes so you will have to remember which one you are on. The Oral-B Genius 8000 and Genius 9000 do have icons however are more expensive. Does this electric toothbrush come with a travel case? Yes it does indeed. It comes with a very nice, premium travel case which provides great protection for your electric toothbrush handle when you are on your travels. 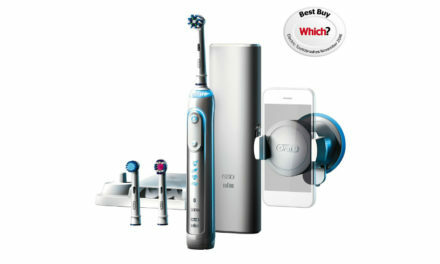 The Oral-B Smart 6 6000 is an excellent electric toothbrush that comes with many great features. It has a great travel case, lots of cleaning modes and a smartphone holder. It is only really let down by the charging station and the lack of icons. If these features are not essential to you, then it is a fantastic electric toothbrush for your money. Summary An expensive yet brilliant electric toothbrush. Oral-B have done a really good job with this one. Valuable information. Lucky me I discovered your site by accident, and I am shocked why this accident did not came about earlier! I bookmarked it. Thank you Temple for your kind words.